Project obstacles and solutions: In April 2014, Canadian-based Champion Petfoods announced its intention to build a new Pet Food Kitchen in Auburn, Kentucky. The facility is the third of Champion's Pet Food Kitchens and was needed to handle production and distribution to U.S. markets. After a two year search, the Logan County site was chosen due to its fit with the Champion philosophy of using only locally grown ingredients in their pet foods. The 84 acre site sits in the midst of the Kentucky farming heartland and includes a rail spur for easy shipping. Ground was broken for the $85 million facility in July 2014. Gray Construction was hired as the general contractor for this project. SRC handled all of the concrete finishing. 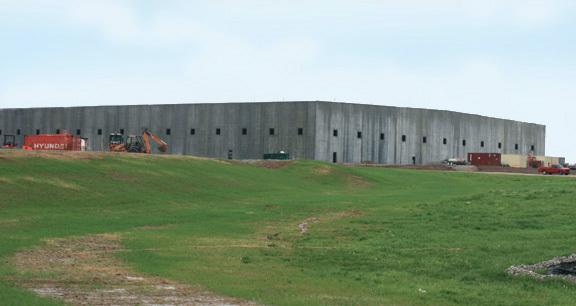 IMI supplied 17,000 yards of concrete for the project, including 5,000 yards for the footings and piers, 8,000 yards for the floors, 3,000 yards for loading docks, and 1,000 yards for mezzanine areas. The new facility had a number of challenges. With 350,000 square feet under roof, the sheer size of the floor called for a concrete mix that could be poured slab on grade with minimal control joints and would not cause curling and shrinkage issues as it dried. The floor was specified to be poured at a depths ranging from 6 inches to 48 inches. IMI QC/QA worked with the engineers at Gray to design a mix that would meet strength requirements, remain workable for the SRC crews, and keep w/c ratios low so curling would not be an issue. IMI used a blended coarse aggregate in the mix, which worked well with the rebar laid out on 12" centers. The use of larger aggregates increases strength without adding more cement to the mix, which would require more water, the source of curling and shrinkage problems. Champion Petfoods is scheduled to begin operations in the new Pet Food Kitchen in January 2016. For more information on concrete designs for large floors, contact our sales representatives.Click here.